Want a discount? 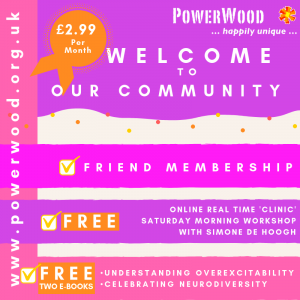 Become a member by purchasing FreeBee PowerWood Community Membership, Friend PowerWood Community Membership or Sat 8 June 10 am - 11.30 am Question Clinic - FREE for FRIEND Members! In neurodiverse families children may sometimes display behaviours that are often associated with psychological disorders e.g. OCD (Obsessive Compulsive Disorder), Phobias, Self-Injury, Eating Issues, PDA (Pathological Demand Avoidance) etc. Within PowerWood we call these behaviours Narrowing Behaviours as they may limit our children’s freedom to explore opportunities and make choices freely and are experiencing the Cycle of Emotional and Sensory Overload. 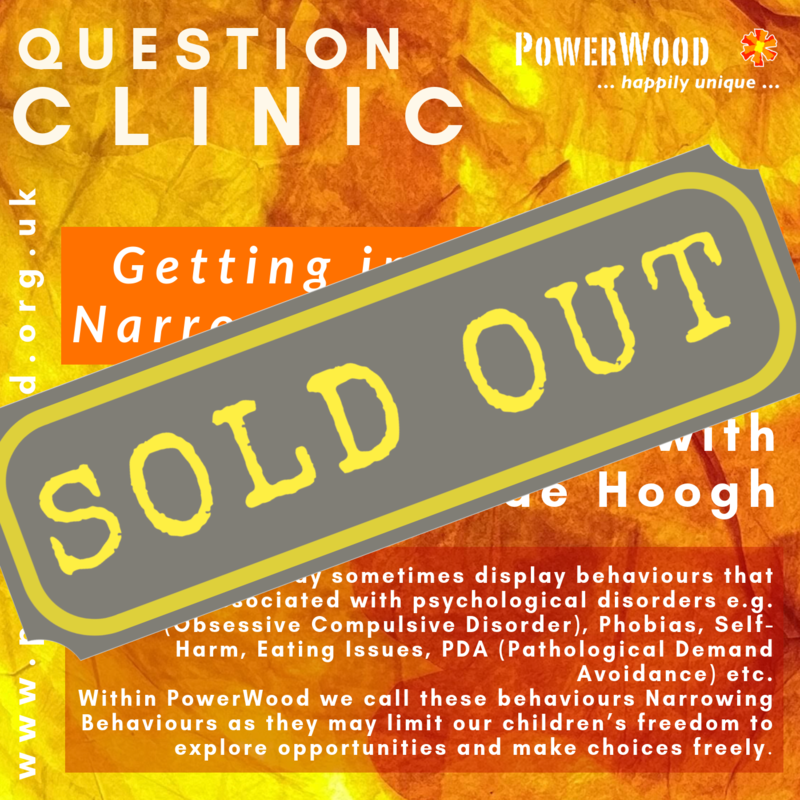 This workshop is designed to inform and empower parents and carers who want to help their child to get in charge of them, and model intrapersonal communication methods empowering children to stay in charge of Narrowing Behaviours also in the future. Simone de Hoogh will explain Narrowing Behaviour, underlying theories and how to get a handle on it. 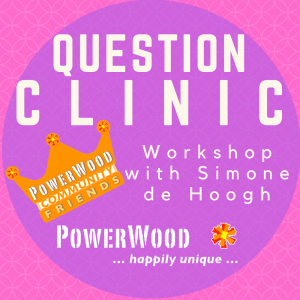 The workshop will also allow participants to share challenging real-life situations around this topic and unpick it together with Simone to get further clarity which factors are at play and Simone will share additional theories, strategies and tools that can be helpful in those real-life situations. If we succeed in making a reasonable quality audio recording this will be made available to you as well without any extra costs. 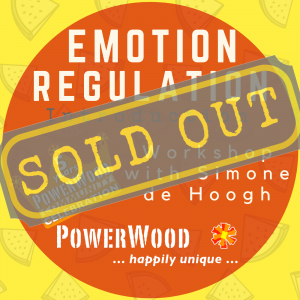 Simone de Hoogh has more than 20+ years experience of working with neurodiverse children, teens and adults, over the years she has collected theories that help to understand and feel compassionate to ourselves, our children and others and has developed MERT (Multi Emotion Regulation Theory) full of simple strategies and tools that can be used directly to support ourselves and others in directing positively the energy associated with Neurodiversity towards self chosen goals. You will receive an invitation from Google Calendar before the time, on which a direct link will be to this workshop on the agreed time. You can click on this link before the video call to check if it works for you. If you are not familiar with this platform, read about how to get started with Google Hangout and the technical requirements. We would also like to advise to try Google Hangout with a friend to get familiarised with the Platform Google Hangout that we will use before the workshop. We are not able to support you with any technical difficulties. 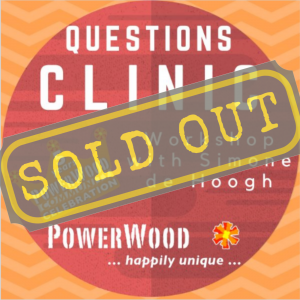 PowerWood will be recording the audio/video of this workshop and will use it for promotion and to sell it in our shop for those that miss the live session. By purchasing this workshop you give your consent to us for doing so. If you don’t want to be in the film please disable your camera on the given online platform before the workshop starts.